Charles-François Daubigny was one of the first artists to focus on capturing the momentary effects of light on a landscape. Though he was of an earlier generation than the Impressionists, you can see in this luminous sky that he foreshadowed their interest in light and atmosphere. Like the Impressionists, Daubigny enjoyed working outside. He painted what he saw on the spot, rather than taking sketches back home to create a finished work in his studio. For river scenes like these, he worked from a boat that he had converted to a floating studio. Claude Monet would later do the same. Daubigny named his good friend, the artist Camille Corot, honorary captain. 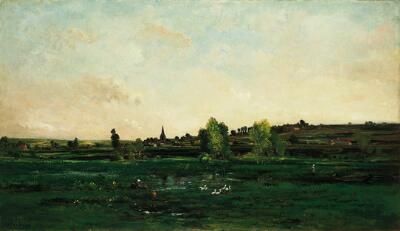 Being in a boat and away from the shore gave Daubigny a different perspective on the landscape he was painting.